In case you haven't heard, blogging is in. Just how in is it? Well, 2.7 million blog posts are published every single day. Tumbl alone has over 319 million blogs created in the last five years. And it doesn't stop there, just look at how quickly this daily counter of published blogs goes up. So, unless you've been cut off from civilization for the past 35 years à la Brendan Fraser in Blast From the Past, you should be very familiar with how popular blogs are. They're an excellent way to communicate your beliefs, feelings, inspirations, and random thoughts to millions of people all across the globe. But despite their broad reach, individual bloggers can still find it difficult to stand out among the rest of the World Wide Waste. Even bloggers with thousands of readers can struggle with keeping things new and exciting for their readers. So while the blog format is very much alive and well, a new twist on an old platform is needed. That twist is live user engagement. With traditional blogging, writers make a post and then leave it for their audience to read later. They sometimes respond to user comments, but that's not the norm. Live user engagement in the form of an interactive Q&A chat turns this paradigm upside down. It doesn't replace the tried and true blog format, but is a supplement that enhances the user experience by letting your fan base ask you whatever their heart may desire! Consider the possibility. Once a month try NOT making a blog post, and instead field questions and comments from your users in a live chat. It's easier to do than you'd think. Just check out this post explaining how to set it up, or go to www.jotcast.com and click Create Chat. And of course remember to tell your readers in advance when you'll be starting the chat. I haven't even gotten to the best part yet. 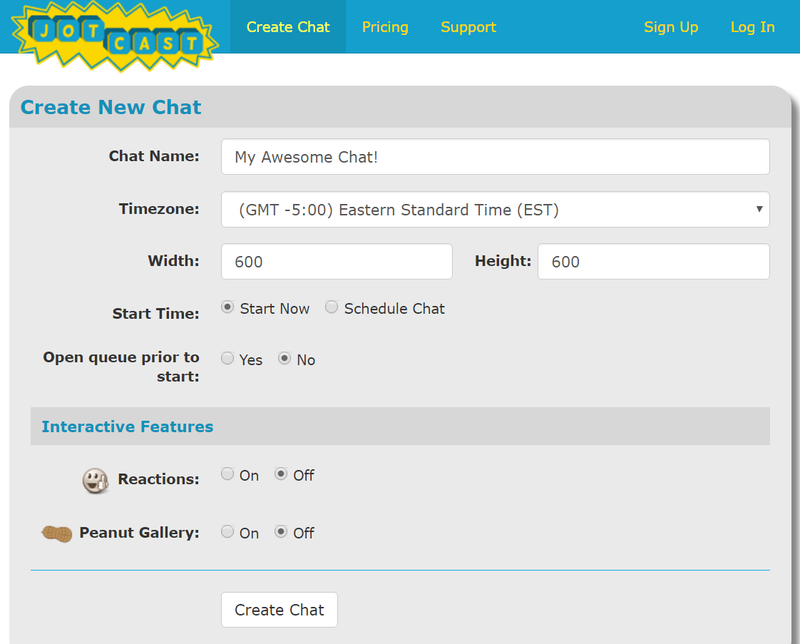 Don't worry, here it is...you can put the chat directly into your blog! Don't believe me? Look below! I created an ongoing chat and placed the HTML into my blog. Pretty nifty right? Just don't expect me to reply to your comments right away. Happy blogging! Welcome to the first installment of the JotCast Blog. Our mission is to help you interactively communicate with and engage your user base so that they keep coming back to you for more. Whether you're an educator fielding questions from students, a sports writer discussing the day's games and trades, a news organization following the latest trends and hashtags, or a fellow blogger looking to interact with your readers, we're here to help you develop and grow your brand. Lets start with the basics. So what is JotCast you're wondering? Good question! JotCast is a chat program. Well, not JUST a chat program. You decide which comments to publish, which to reject, and which to save to publish later on. Only once you publish a comment will everyone else see it. That way you control the content and flow of the discussion, while filtering out any unwanted input. After all, this isn't the Wild Wild West. You see, anyone can enter the chat and submit comments or questions, but as the chat host only YOU see those comments. Ok, how do I use JotCast? Well that's easy. 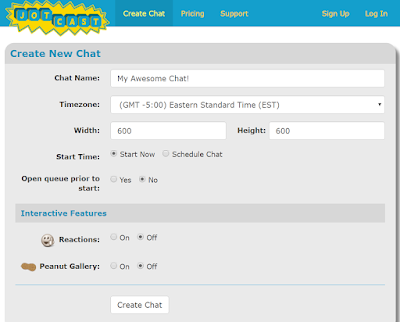 First create a chat by going to www.jotcast.com and clicking Create Chat in the navigation. Fill in some chat details, like chat name and start time, and hit submit. You can then create a free account, or log into your existing account. It's that simple! 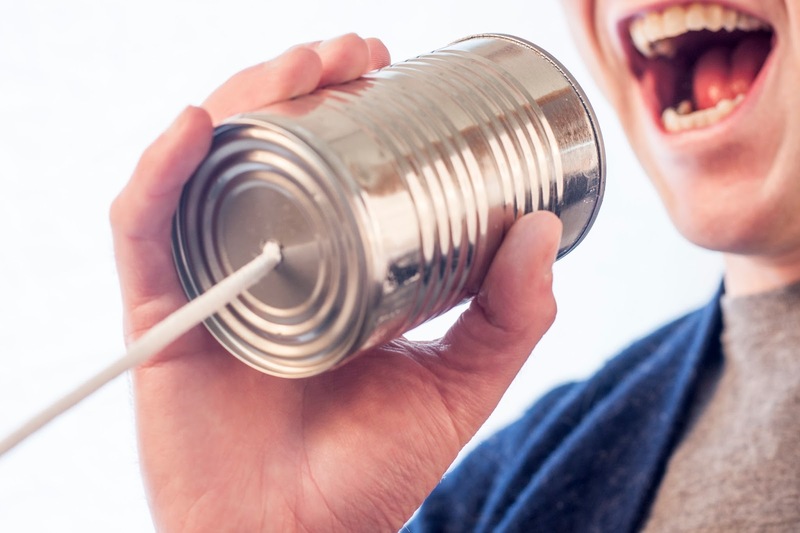 Once the chat is created you can share the chat URL with your users, or use the iframe code we generate to put the chat directly onto your website. How can the service be free, is there advertising? Nope, we don't advertise at all in our chats. Your free account gives you 1,000 minutes of reader time per month. That means that you can have 1 reader in your chat for 1,000 minutes each month, or 1,000 readers for 1 minute, or anywhere in between. If you don't have a lot of users, don't have a lot of chats, or just want to see what JotCast is all about then the free account is probably what you're looking for. If you have a larger user base from hundreds to thousands of readers than you'll probably want to upgrade to one of our paid plans, or contact us to create a custom plan that matches your specific needs. Well, I think that's enough for one day. Thank's for reading!